Summer is the best time for getting outside and enjoying the outdoors, but there are those days when you just want to be inside of an air conditioned building. The Summer Movie Programs all around the state are the perfect opportunity to take your kids to the movies without paying a lot. Most of these movies are rated PG or G, and are the perfect Summer activity. Below are some programs we have found. If you know of one we have forgot, please email us at contact@enjoyutah.org. View our Movies In The Park schedule! 12 movies, 12 weeks, only $12. Tickets available for purchase at Guest Services. Kids and accompanying parents or guardians will enjoy 12 classic G or PG rated family films. * One film each week at participating Megaplex locations. Summer Movies begin the last week in May. View complete details by clicking on the title above. We recently checked out the new Megaplex theatre at Valley Fair Mall, and it’s fabulous! Ten films for $5, or $1 per show. Our favorite place for this program is Cinemark at Jordan Landing, but this program is going on at Cinemark theatres all around the country. Follow the link above to choose a location near you. Located in Orem, the Scera indoor theatre has two different movie series available, each featuring 11 of the most current and popular family movies on the big screen for an absolutely amazing price! 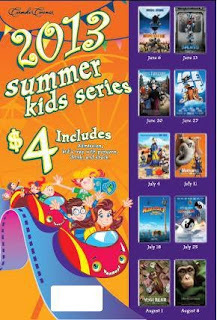 $4.00 gets you into the movie, a kids tray (with popcorn, drink, and candy) and a same day, unlimited wristband for rides, skating, and golf at the Hollywood Connection!! The Pleasant Valley library in Ogden has free movies (indoor) that I'm checking out. Thanks for the great list. Also, there's nothing like showing movies outside in your own yard - I had a neighbor who did that and we loved it.